When I heard that Laura Andersen was coming out with a new trilogy, I jumped at it. I loved her Boleyn Trilogy (The Boleyn King, The Boleyn Deceit, and The Boleyn Reckoning) and couldn't wait to see what she had in store next. The answer: more of the same. Now, this is not necessarily a bad thing--after all, I truly enjoyed her first trilogy. However, this book is like the 4th book in a trilogy. The 3 books of the Boleyn Trilogy read like a trilogy--they worked together as a whole and came to a satisfying ending. Now, we have a continuation of the story with Dominic and Minuette's children and Elizabeth's daughter (in Andersen's alternate universe, Elizabeth was married to Philip of Spain). Is this a problem? Not really, except that you really need to read the original trilogy before starting this book. Seriously. I can't see how anyone who had not read the first 3 books would have any clue what is going on here. On a petty side note, I feel like I have to mention the cover art. The first three books had very nicely designed covers and I wish the designers had carried that through to this book. Frankly, I find the cover of this book a bit tawdry. Okay, back to the bones. So, this book is called The Virgin's Daughter but, it isn't about Elizabeth's daughter. Princess Anne Isabel (called Anabel), who is the daughter of Elizabeth and Philip of Spain, is a character in the book, but she is secondary at best. Instead, this book is about the oldest daughter of Dominic and Minuette, Lucette, who was born in the last book of the previous trilogy. Lucette was a fun, if not realistic, character. Elizabeth basically uses her as a spy, which would never have happened in the "real" Elizabethan England, but in this one--sure, why not? Lucette is, of course, smart and beautiful--but not too smart, and I think that is what I liked most about her. She made mistakes and she misread things. Basically, she wasn't perfect. She is sent to visit (er, spy) the home of her family's friend, Renaud LeClerc (a character in the first trilogy) to sniff out a possible conspiracy to assassinate Queen Elizabeth. There she meets up with the two LeClerc brothers, who themselves are estranged. There are a cast of supporting characters, both historical and fictional. In this book, Andersen uses more fictional than historical characters, which is change from her first trilogy. Among the "real" people, we have Elizabeth I, Philip of Spain, Sir Francis Walsingham, Dr. John Dee, and Mary, Queen of Scots. The rest of the characters are of Andersen's creation, which makes this one more step removed from fact. I say this only because some people (okay, I am one of them) are sort of sticklers for historical accuracy, so they need to keep in the forefront of their mind that this is "alternate" history. I hope that the next two books more deeply explore the younger set in these books. This is Lucette's book, but will the next be Anabel's or Pippa's (Lucette's younger sister, who I found very interesting)? We can only wait and see, but Andersen has set up some interesting possibilities for the coming books. I found the plot of this book to be fast moving and fun, but Andersen's writing didn't seem quite as tight as it did in her first trilogy. I'm willing to forgive that because I do think she has an interesting story here. While I'm still trying to figure out if I'm reading a new trilogy or an installment of a series, I would recommend Andersen's books. 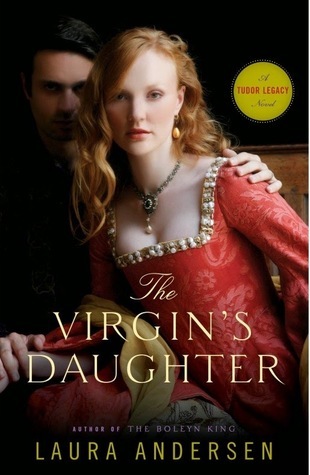 I would strongly, strongly urge any reader to start with The Boleyn King and go from there but, if you've already read her Boleyn "trilogy" and enjoyed it, this would be a "must read" for you.